Barclaycard has a rich history; in fact, it’s roots go as far back as 1690 when John Freame and Thomas Gould began trading in London and by 1736, James Barclay, who married Freame’s daughter, became a partner in the rapidly growing bank. The late 1800s brought a lot of promise for the turn of the century as more than 19 banking entities combined to form Barclay & Company Ltd. What’s so fascinating is that there were more than 180 branches serving consumers and protecting deposits that totaled £26 million. It played a significant role in financing technology for its time including financing two of the fastest passenger ships ever created. Two decades later, Barclaycard became an important financial partner with the biggest UK car manufacturer, survived devastating events, including bombings, and had well established its role in the global economy. Sounds like a great track record until you fast forward to 1967 when the world’s very first ATM was revealed by Barclaycard and you realize it’s far more than a great track record: this bank has been a decisive part of history both in the UK and here in the U.S. Soon, it became the first British bank to run its advertisements on television, raising the bar once again. 1986 was a big year as it became the first bank in the UK that had its shares listed on both the New York Stock Exchange and Tokyo Stock Exchange. This Barclaycard co-branded Visa has a lot of attractive features that were designed to first, entice new customers and then to keep those customers as they evolve into loyal Barclaycard consumers. The perks are many and include a 2,5000 bonus in points after your first purchase as well as a 0% intro APR for balance transfers for fifteen months. You can enjoy free online shopping and earn 3 points for every dollar spent at Williams Sonoma and 1 point for every dollar you spend anywhere else. We really like the idea, too, of bonus $25 gift cards or statement credits that serve as continued appreciation gifts. You’ll enjoy the absence of an annual fee as well. You will incur $35 late fees and your APR for cash advances taken out on your Barclaycard card is charged at 25.24%. 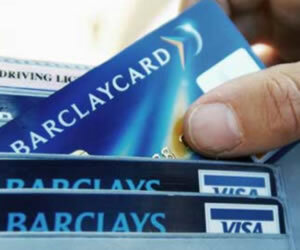 Good credit scores earns approval for this Barclaycard credit card. This is another relatively new member of the Barclaycard financial family. It too has a lot of great perks and benefits, including a limited time offer of an additional 25,000 bonus points after your first purchase along with 5,000 bonus points if you make a balance transfer in the first thirty days of account opening, 3 points for every dollar spent on Virgin America purchases and one point for every dollar spent elsewhere. We like Virgin America Visa Signature card because of its low intro rate for balance transfers during the first fifteen months of membership. Like to travel? Then you’ll like the idea of a $150 savings off of a companion ticket annually with no blackout dates for any seat and for any time of the year. There’s a $49 annual fee associated with this card offer, but the benefits and low APR make it a smart choice. Spend $25,000 every year in eligible purchases and you’ll see an additional 10,000 elevate status points along with 300 bonus points for every $5,000 every year. Maximum amount of these points cuts off at 1,200, but it’s still a great way to rack up those bonus points. We wanted to include this card offer because it was designed for those with average credit scores. With the tough economic times over the past few years, there have been many whose credit has taken the occasional hit. Even those with one-time perfect credit may have seen results of a single late payment. For those who are looking to rebuild, this is a great choice. The 0% intro APR for six months on both purchases and balance transfers is a big bonus, partly because that’s not always an option for card offers designed for those with less than stellar credit. There’s no annual fee and you’ll earn 2,500 bonus points after your first purchase. Enjoy two points for every dollar spent on gas, groceries and even utility expenses and one point for every dollar spent on anything else. There’s no blackout dates, redemption fees or limits on how many points you can earn. The best part is the monthly reporting to the credit bureaus, which as we know is the only sure way to improve credit. Apply Barclaycard Rewards MasterCard online for an instant decision. In one last bit of news on Barclaycard, on Monday, it announced it had just appointed a new Head of Cash Management leader for its New York based operations. Lincoln Fritz will now be overseeing the cash management services for non bank financial institutions and large American corporations. It’s a sign that the bank continues to grow its US-based transaction banking presence. Fritz comes with a quarter century experience and has spent the last several years with HSBC. This is an exciting time to be joining Barclaycard and I look forward to leveraging the strength…to deliver superior solutions. Lincoln’s cash management experience makes him an ideal candidate to lead our cash management offering in the US. His appointment builds upon our strategy of enhancing our presence in the US market by delivering best in class financial solutions to suit our clients’ business needs. As per MAR 2, 2016, the above listed BarclayCard offers are no longer available.